The Filorga Oil Absolute is an exquisite anti-ageing treatment designed to tackle wrinkles, dark spots and dullness in as little as 30 days. The unique, serum-like formula glides onto skin and rapidly absorbs, providing a powerful shot of active ingredients, including a stem cell-derived Hexapeptide and antioxidant-rich Polyphenols, which work in synergy to reactivate and regenerate skin to promote a firmer, more even tone. A delicate blend of four precious oils – Camellia, Buriti, Jojoba and Apricot – cocoon the skin with intensive nourishment and moisture, wrapped with essence of Amber for superior comfort and efficacy. The complexion is left positively glowing, with a redefined surface texture and a dramatic reduction in the appearance of wrinkles and fine lines. Pour 2 or 3 drops of product into the palm of the hand and warm it up. Use morning and evening, applying gentle pressure to the entire face and neck. 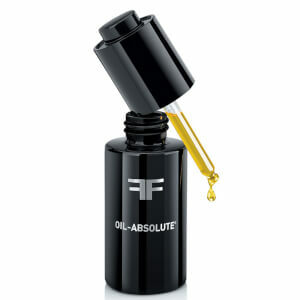 Use the fingertips to massage in, smoothing the oil-serum from the centre of the face outwards. Use alone or before moisturising. Caprylic/Capric Triglyceride, C15-19 Alkane, Dicaprylyl Carbonate, Polyglyceryl-2 Sesquioleate, Dicaprylyl Ether, Pentylene Glycol, Mauritia Flexuosa Fruit Oil, Aqua (Water, Eau), Camellia Oleifera Seed Oil, Prunus Armeniaca (Apricot) Kernel Oil, Simmondsia Chinensis (Jojoba) Seed Oil, Parfum (Fragrance), Dimethyl Isosorbide, Tocopheryl Acetate, Propanediol, Sesamum Indicum (Sesame) Seed Extract, Disodium Phosphate, Pistacia Lentiscus (Mastic) Gum, Tocopherol, Sodium Phosphate, Caprylyl Glycol, Humulus Lupulus (Hops) Strobile, Sucrose Palmitate, Glycine Soja (Soybean) Oil, Sophora Japonica Flower Extract, Acetyl Hexapeptide-8, Amber Powder, Glyceryl Linoleate, Prunus Amygdalus Dulcis (Sweet Almond) Oil, Sodium Chloride, Helianthus Annuus (Sunflower) Seed Oil, Glucose, Phenoxyethanol, Sodium Hyaluronate, Citric Acid, Potassium Chloride, Potassium Sorbate, Calcium Chloride, Magnesium Sulfate, Glutamine, Ascorbic Acid, Sodium Acetate, Lysine Hcl, Arginine, Alanine, Histidine, Valine, Leucine, Threonine, Isoleucine, Tryptophan, Phenylalanine, Tyrosine, Glycine, Polysorbate 80, Serine, Deoxyadenosine, Cystine, Cyanocobalamin, Deoxycytidine, Deoxyguanosine, Deoxythymidine, Glutathione, Asparagine, Aspartic Acid, Ornithine, Glutamic Acid, Nicotinamide Adenine Dinucleotide, Proline, Aminobutyric Acid, Methionine, Taurine, Hydroxyproline, Glucosamine, Coenzyme A, Glucuronolactone, Sodium Glucuronate, Thiamine Diphosphate, Disodium Flavine Adenine Dinucleotide, Sodium Uridine Triphosphate, Retinyl Acetate, Inositol, Methyl Deoxycytidine, Niacin, Niacinamide, Pyridoxal 5-Phosphate, Pyridoxine Hcl, Biotin, Calcium Pantothenate, Folic Acid, Riboflavin, Tocopheryl Phosphate.